← Google tax – will it threaten Kings Cross or will Google just offset against USA tax bill? A local resident has secured a startling new artists impression of the building the Institute of Physics are applying for planning permission for at the corner of Balfe Street and the Cally Road (behind the cocktail bar). 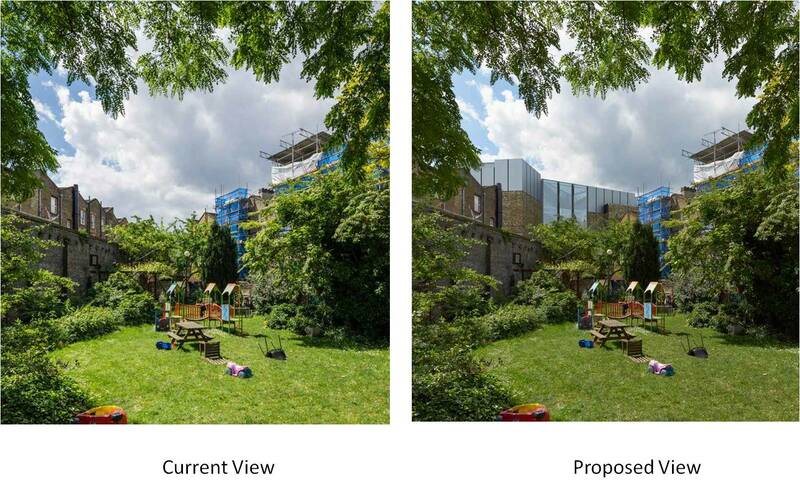 This is the proposed view from the communal gardens – a huge wall of glass and steel to the South. You can still comment – Islington accepts comments in practice up to the point of the decision making committee and have done so for many years, the 2 October deadline is just an administrative thing. And this is new information so if it moves you to comment you have every right to do so but get your skates on. The plans and the link for comments are online here. The reference number is P2014/3577/FUL and our previous post is here. The more I look at the Institute of Physics proposals, the more I think they have just got their approach wrong. Their needs and plans are more than comfortably be fitted into this site in a conservation area. And in tactics they would have been far wiser to have bought an option on the site subject to getting planning permission rather than snap up the freehold here – this was what the Whitbread team did on the corner of Wharfdale Road and York Way – they could see it was a sensitive site. If I had to guess I think the IoP will withdraw these plans before determination and then submit something smaller in a few months, though given utility they seek from the building, it won’t be much smaller. If the council turn this down, which they would have every right to do given the local plans and policies breached, particularly the conservation area then IoP are left with nothing. It’s an old trick to withdraw when you can see a very risky planning meeting coming and when you come back a second time a developer usually reckons on a reduced local campaign and better chance at appeal. Though people around KX are more determined than might appear. This entry was posted in Big developments, Planning, Licensing and Regulation and tagged balfe street, institute of physics. Bookmark the permalink. I don’t see that that is so terrible, much less serious than the massive building that blocks out our light and that of the four other houses in the row we live in, for which Camden Council granted planning permission regardless of our objections, because the owners are so wealthy. And it is a block of flats and young children live in it, despite the fact that our area is very un-child-friendly. I live directly behind/under/boxed in by the proposed building, so this will certainly block our light and ability to enjoy our property. The drawing here is clear on that, even though they have dramatically stretched the perspective so the building feels further from the garden than it will be in real life. The fact remains that they are taking a two-storey brick facade and whacking two more great storeys of steel and glass on top of it – and suddenly we all live in Canary Wharf. As the original post suggests, I would not fancy their chances at withdrawing and then sneaking through on a second approach – they picked the wrong ward if they think people will not pay attention. One more note, to any neighbours who feel this will be a negative addition to the area – please do comment on the Council website. It takes only a few minutes and is a good way to make sure your voice is heard and your opinion is taken into account. You can email your input l to planning@islington.gov.uk and reference the application number 2014/3577/FUL. I agree this is an extremely intrusive and overbearing rear elevation. We have asked for the Council’s independent Design and Conservation Panel to review the application and provide comments. I recently had the opportunity at an informal meeting with the applicants to say I thought the design was significantly out of keeping with the conservation area. Modern design can often work well with the heritage buildings but I think this is a singularly poor example of modern design fitting with old. We also told them the rear elevations were a problem although, at the time, I had not seen the illustration now obtained. Elsewhere in the same conservation area, Islington’s planners have strenuously resisted all modifications to rooflines including changes to residential properties whci are less than 50 years old and don’t even form part of the area’s historic fabric. It would seem perverse to keep refusing modest residential extensions and then permit a large scale developments like this, regardless of the other benefits from such a scheme. (I need to say the following: as one of a number of substitute members of Islington’s planning committee, there is a slight theoretical possibility I might be asked to sit on this application but will decline to do so. I am therefore not a decision-taker on this case). I very much hope the IoP will make further changes because their presence in south Islington would be very welcome. As Will says, the IoP made a very odd decision to purchase the freehold of a building on which they had no planning permission. This is a very unusual thing for any property owner to do if they intend to develop the building or land.